Hello From In The Circus Of You!!! Yes another collaboration from Nicelle Davis and Cheryl Gross. Free shipping with preorders, (what a deal!) Watch the book trailer, order the book and help support this very important small press. Free shipping if you preorder. If you have read and enjoyed our other books, you will love this one. 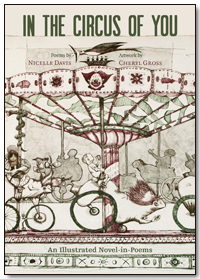 Nicelle’s poetry and my illustrations are the perfect combination of our take on life and the circus in which we live. BTW: The book trailer is pretty awesome if I do say so myself. If you would like to watch a clown turn into origami and slide into a pair of pants, then this is something you should see. Aside from this wonderful, beautiful new book, I have blogged about our latest pet that lives in our bidet. Don’t forget to read about our adventure last night concerning the fire drill. That was probably the most excitement Dilsberg has seen in a very long time. Probably since the last fire drill. I believe they actually set something on fire and put it out. That’s the way it looked from the window. Lots of smoke. Then I thought perhaps they used a smoke machine, but that smells different. Anyway, check out the book and stay tuned….I’ll be back next week. This entry was posted in LGBT, LGBTGO, Poetry, Science Fiction and tagged art, books, Cheryl Gross, CM Gross, DaDa, defiled, deformity, illustration, In The Circus Of You, LGBT, poignant, Rose Metal Press, science fiction, Surealism, The Z Factor, transgender, video bardo, Video poetry, WTF, Z, Zebra Poetry Film Festival. Bookmark the permalink.